Opera demonises and punishes its most passionate women so often that I can't help wondering when they'll bring on the boiled bunny-rabbit. In today's Independent I've been musing a bit about whether there was a musical Hays Code lurking in the opera world of the 19th century. Verdi's consumptive courtesan is back at the Covent Garden from Monday. Meanwhile, if anyone fancies collaborating on the creation of Fatal Attraction, The Opera, do give me a shout..
Kings Place from 7-9 October is hosting a festival entitled Notes and Letters, a super example of the type of event that has really put this doughty venue on the map. Music and words meet and mingle ina panoply of intriguing events - you can see the full programme here. On Sunday 9 October at 12.30pm I will be in the interviewer's chair to talk to Sir Peter Maxwell Davies, aka "Max", about the focus on myth and madness in his music. Come along and meet this astonishing composer (pictured above), whose output as listed on his website runs to a cool 54 pages and ranges through everything from Classic FM favourites such as Farewell to Stromness to the stunning inventions of Eight Songs for a Mad King, operas, masses, the series of Strathclyde Concertos, heaps of chamber music and a slew of symphonies, including an Antarctic Symphony that is still waiting to be recorded. Here's an extract from Eight Songs for a Mad King...the sort of piece that can make you feel like a child with a clock, itching to take it apart and find out how it works and how it fitted together in the first place, without necessarily having a clue about how you might build it yourself. Saturday Bach time again, and here's a masterclass with Andras Schiff to show us how. In the JC this week I have an interview with Zofia Posmysz, author of the semi-autobiographical novel on which Weinberg's The Passenger is based. She is quite remarkable: poised, radiant, eloquent and forgiving. Read the piece here. I'm going to see the opera tomorrow. The interview contained more interesting material than there was space, so here is one of the out-takes, which was not directly relevant to The Passenger, but will be of great interest to anyone who is preoccupied, as I often have been, by Alma Rose - Mahler's niece - and the Auschwitz women's orchestra that she conducted. JD: Did you have any contact with the Auschwitz women's orchestra? ZP (via interpreter): "Yes, I did. It was when Alma Rose started conducting the orchestra that it gained some sort of status and quality. She searched among the prisoners – they were very educated people, professors, artists, all sorts. She looked for prisoners who had a musical education – for instance, there were two excellent, wonderful singers, they were Hungarian Jewish. And since I was working in the kitchen and I had access to some of the products there, I would sometimes go to the orchestra block and take them something. "I had a friend who’d helped me along in the past, helped me survive through some of the hard labour outside the camp at first, helped me persevere another 15 minutes and then another 15 minutes; this friend was a violinist and I managed to persuade Alma Rose to consider taking her into the orchestra. She said: "Let her come, but I have to listen to her." And I told my friend: "Listen, I’ve found this fantastic thing for you. You can play in the orchestra and it will give you a chance to survive." She was so thin by then that she was on her last legs. And to my great surprise and regret, she said: "Am I to play here for those people?" To this day I don’t know what she was thinking about. What happened was that there was a ramp that led to the gas chambers and the crematorium, and the orchestra had to stand by the ramp and play these tunes for the transports so that people didn’t know what was happening at all - it was a deceit. I don’t know whether my friend didn't want to play for the people in this situation, or in the concerts for the SS men. Either way, she didn’t agree. A few months later she died." Here's my piece from yesterday's Independent about Arthur Pita's new dance theatre work based on The Metamorphosis by Kafka. One day Edward Watson awoke to find that he had been transformed into a giant insect.... It's at ROH2 all this week. The Metamorphosis is the book of the moment. I've been in Paris for a couple of days to do an interview and while there I also met up for tea and tarte aux framboises on the Place des Vosges with Mikhail Rudy (he of The Pianist and the animated Kandinsky Pictures at an Exhibition). His next collaborative project, due for premiere in Paris in March 2012, is based on...yes, The Metamorphosis, and will involve film projections by the Quay Brothers to a selection of Janacek piano music. Meanwhile he's bringing Pictures to the UK in November - performances in Southampton (17 Nov) and at the Wimbledon Festival (19 Nov). Well worth the train ride, imho. Meanwhile, my interviewee - an intergalactic opera star - talked to me for two hours, then sent me home with a red nose. That is a first. I hasten to add that it's made of foam. It is now perching on my desk lamp, smiling at me (in a manner of speaking), while I think of his unforgettable performance as Werther earlier this year. I've just found part of my favourite Bach cantata on Youtube conducted by John Eliot Gardiner, who seems to know exactly what to do with it. I first heard Cantata BWV 8, 'Liebster Gott, wann werd'ich sterben', when I was a student, ploughing through the complete catalogue on LPs in the university music library, and it was love at first toot. There's never been anyone else in the history of music, to the best of my knowledge, who could write for two oboes - oboe d'amores, here - as Bach could. Gardiner, though, captures the reflective, ineffable quality of this music and its text, wearing his learning lightly, packaging up a heart of compassionate tenderness within a streamlined 18th-century casing. Here's my piece from today's Independent about Weinberg's opera The Passenger, which opens at ENO on Monday. Interestingly, I've been hearing Weinberg's name for years from my various Russian musician friends who from time to time all let fly with minor rants about what a terrific composer he was and how ridiculous it is that we never hear his works. But if anything can put him on the map, where he should be, it is this: an opera evoking reminiscences of Auschwitz. David Pountney talks to me about why The Passenger can do this when others can't, and we trace the history of Weinberg and ask why he is the composer that time forgot. 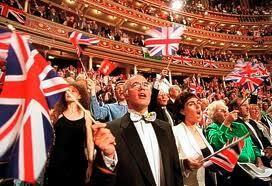 It's the Last Night of the Proms today. What's the matter with everyone? Why are people not jumping up and down, shouting about disgusting jingoism? 1. We're all looking forward to it a lot, especially to hearing Susan Bullock and to witnessing - if it's filmed - Lang Lang's dizzy dash from park to platform. 2. We need something to celebrate at the moment, the Proms are worth celebrating and this is how they are traditionally celebrated. This has been a vintage year, to put it mildly. 3. The country is becoming more nationalistic as times grow harder. 4. The Last Night is finally being recognised for what it truly is: a bit of good old harmless fun to raise the spirits. Which is your favourite explanation? Did you know that people care this much about classical music? They do. And in a world full of cyber-chatter, talking about what you care about has never been easier — or more important in spreading the message about its existence. Talking points at the Proms have been the festival's best marketing tool in years. Read the whole thing here. There's a very snazzy pic of The Dude on site. My interview with Eva-Maria Westbroek in today's Independent features some startling revelations about the effect of those fake breasts in Anna Nicole. She talks about taking on that role, what it was like to sing in the live cinecast of Die Walkure from the Met, and her forthcoming role in Il tabarro at Covent Garden (opening next week). Wonderful singer, wonderful woman. The only bit that's missing is her beloved dog: she has a Cavalier King Charles spaniel called Ruby, who goes with her all over Europe. Anna Nicole might have approved. A Hungarian newspaper, Bors, has run a most bizarre story about strange goings-on in the Hungarian State Opera House. According to this report, mysterious accidents and illnesses allegedly blight the opera company and some rumours have been suggesting that this is being brought about by "black magic". Here's the original in Hungarian, if that's helpful. The article goes on to cite (again, according to Google Translate) a case of epileptic seizures without previous history, while also suggesting that a young conductor suffered a nervous breakdown. In Bors, the picture of the singer Ilona Tokody is captioned: "An elusive force pushed me into the depths"; according to their interview, she fell off a ladder and sustained a back injury. And that's just the start. The translation suggests she is saying that six other people have suffered accidents or illness, then adds: "I could not fight against it, but my guardian angel took care of me and saved me." My Hungarian friends say the whole thing is complete nonsense...and actually it sounds to me much like business as usual in the theatrical world... Or perhaps a health & safety executive could look into the condition of the historic building, in which Mahler and Klemperer both conducted once upon a time. Meanwhile the company's management is in a state of flux. The music director Adam Fischer resigned last year in protest over the Prime Minister Viktor Orban's media laws. Of which more shortly. Tragic news is through that the tenor Salvatore Licitra has died in Sicily, aged 43. He had been in a coma since an accident on his Vespa ten days ago. Licitra was a late starter in the operatic world, beginning his career at 30, and making his Metropolitan Opera debut as a last-minute replacement for Pavarotti in Tosca. His voice and progress alike proved somewhat patchy and the comparison to Pavarotti was iniquitous, raising expectations of him too high, too soon; but at his finest, he was a performer of great charm, musicality and flair. The LA Times assesses his chequered career in more depth here. It would be nice to think that the loss of Licitra might prove a strong enough blow to induce Italy - and other places - to introduce a legal requirement to wear a helmet when riding any type of motorbike. Probably it won't, but if it did, it would be a fitting memorial to a much-loved musician. Henry Goodman reads from 'Hungarian Dances' at the Proms! Tasmin talked about her passion for Hamlet, Hesse's Siddartha and the verses of Hillaire Belloc, as well as terming Hungarian Dances "gripping" and "very exciting", and telling a wonderful story about how she inadvertently made her debut in Budapest in a restaurant, playing Monti's Csardas with the resident folk band's cimbalom player after half a bottle of Bull's Blood... And she said some rather nice things about my writing about music that I am waaay too modest to repeat on my own blog, though you can hear them in the broadcast. What you won't hear, though, is Anne's priceless Freudian slip when, signing off at the end of the session, the wrong word emerged instead of "Belloc"! A fine time was had by one and all. 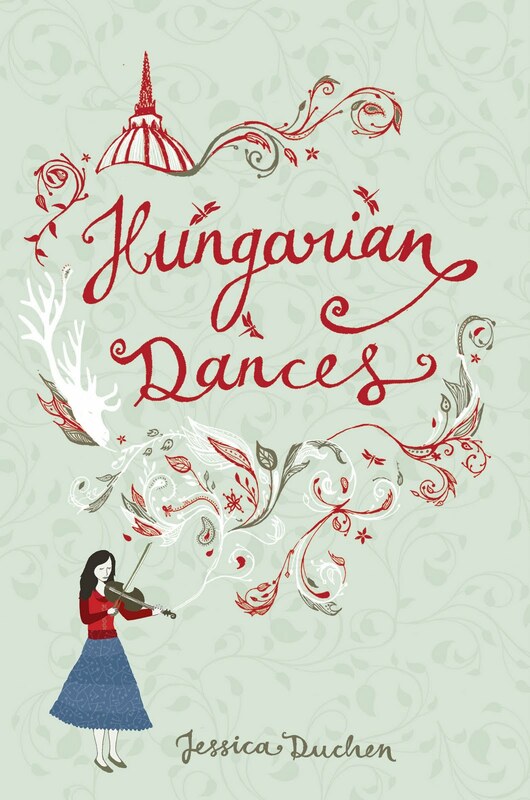 Stop-press news: I'm reliably informed that my novel HUNGARIAN DANCES is to feature as one of Tasmin Little's chosen books in the Proms Literary Festival this afternoon. Tasmin will be discussing her literary favourites at the Royal College of Music at 5pm and the talk is broadcast the interval of tonight's Prom on BBC Radio 3. An extract will be read - I understand they've picked a passage about Gypsy music and the violin in particular. Catch it at the college, on the radio or later on the iPlayer (or catch the book here). That is Paprika part 1 - or chronologically speaking, part 3. Paprika part 2: Today comes hot on the heels of a truly fabulous evening with the Budapest Festival Orchestra and Ivan Fischer last night. It's all true: Ivan Fischer did indeed become the first conductor at the Proms ever to throw a toy animal from the podium into the arena. The BFO is unmistakeable for its characteristic mix of suave, smooth sound and absolutely direct, deeply engaged musicianship; as I said in the feature yesterday, when they play you feel the love. This was no exception: they made me fall in love with Mahler in earnest. After two years of head-bludgeoning Mahler-anniversary overkill, that takes some doing. And so, Mahler 1. Empathy, detail, brilliance, flow and energy: everything was there. Fischer's was a Mahler straight from the heart and guts, tempered by a sensible and incredibly perceptive brain. Shaping of narrative couldn't have been more convincing if it tried - especially the final movement, with its gradations of dynamic in the distantly approaching triumph. I'm a great fan of the orchestra configuration preferred by Fischer at this concert, with the double basses raised in a row along the back providing a solid, oaky depth across the board and the first and second violins opposite each other at the front of the stage. The tone produced is balanced, clear and homogeneous. And this Mahler symphony, for the first time, felt too short. I could happily have listened to it all night. But that's where the third part of 'triple paprika' enters: the late-night Prom, complete with flying bunnyrabbit. The orchestra summoned us back from interval fun with one of the violinists playing some Transylvanian folk music while everyone settled down. The orchestra appeared in its everyday clothes and Fischer took up a microphone to explain how the event would work. We each had a raffle-ticket; the tuba player perambulated through arena and stalls asking punters to draw a number. Three numbers, three pieces, and sometimes a flying rabbit to catch, to choose another. Then the vote, which got everyone beautifully heated as we shouted for our favourites and hissed when someone tried to pick the Ravel Bolero. Everything came off very slickly and rapidly - obviously the band, its conductor and its librarian are a dab hand at the logistics - and between numbers, while the parts were found and distributed there were chances for small groups of musicians to strut their solo stuff: a brass ensemble piece from the movie Eight and a Half, a Telemann piece for four string players, some Bartok violin duos, some more folk music, four percussionists doing a brilliant body-percussion turn and, last but not least, the tuba player with a didgeridoo. So what did we end up with? Kodaly Dances of Galanta; Bartok Romanian Folk Dances; Strauss Music of the Spheres Waltz; Glinka Overture to Ruslan and Lyudmila; and the Hungarian March from Berlioz's The Damnation of Faust. The idea is that the orchestra has no idea what it's going to play beforehand and has had no rehearsal, so anything can happen. Obviously, they knew certain of these numbers inside out and backwards. They gave the Hungarian pieces a terrific workout; the most challenging item seemed to be the Strauss waltz, involving sensual and well-calibrated ebb, flow and old-world rubato. Two conclusions to draw: first, that this was an inspired format for orchestral display of the first water. The solo spots let the individuals shine as they can and should, and if the BFO plays like that unrehearsed....pas mal, hein? Ivan proved a great showman too: "Pass the tuba to somebody who thinks it's all a trick," he instructed. Secondly, the informality of the event made it terrific fun and the music and musicians shone all the brighter for that. Once again, it was the usual Budapest Festival Orchestra achievement of sending you home walking on air, feeling glad to be alive. Could we do Audience Choice here? Well, whyever not? No video available from last night, but here they are playing The Blue Danube in Heroes' Square, Budapest. The Danube, taken literally, is much bluer in Budapest than Vienna. Life goes on, it's Friday afternoon and it's high time we had a Friday Historical from one of my pianistic goddesses, Dame Myra Hess. Here is some all-too-rare film of her: this was recorded at one of her National Gallery Lunchtime Concerts during World War II. It will soon be time for the National Gallery's annual Myra Hess Day and I'll post more details nearer the time. The second unique event in 24 hours is about to hit the RAH, but it's going to be a little bit different from yesterday... 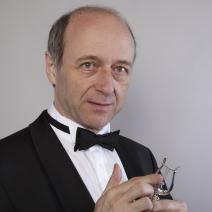 Here comes the Budapest Festival Orchestra and its founder & conductor Ivan Fischer. And though the first part of the evening is a "normal" concert, the late-night one at 10pm asks the audience to choose the music on the spot, from a list of several hundred - all of which will have to be brought along on the van from Hungary, just in case. Please send that librarian some chocolate. Here's my interview with Ivan from today's Independent, in which he explains why he came up with the idea and how it's going to work. Get ready to catch the flying rabbit. Ivan (above) is on a roll. He just won the Royal Philharmonic Society's conductor prize, he is currently on the shortlist to be Gramophone Artist of the Year and in January he and the BFO gave one of the most wonderful concerts I've heard this year. Here they are in the Bartok Dance Suite.